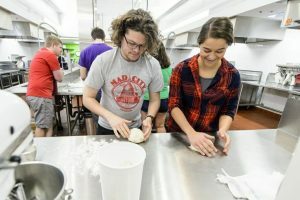 Vials containing different strains of wild Wisconsin yeast sit on a table during the Fermented Food and Beverage class. 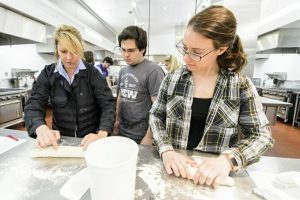 Michelle Clasen (left), of Clasen’s Bakery, demonstrates how to roll bread dough to students Neil Taylor (center) and Samantha Milota. Students Miles Gillette (left) and Mary Wiklanski (right) work with bread dough during a FS 551: Fermented Food and Beverage class. The students in the course are helping to test the strains for suitability in bread baking, and are partnering with Clasen’s Bakery in Middleton, Wisconsin to do so. 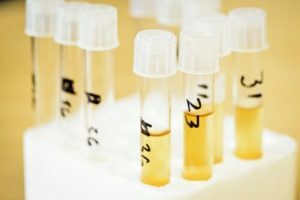 Commercial entities interested in learning more licensing Saccharomyces eubayanus, contact WARF.